One of my goals is to get better about weekly meal prep and make-ahead freezer meals. I've always found that the prep work on a Sunday is totally worth the ease and convenience of having ready made meals and prepped vegetables during the hectic week. Now I just have to get better about doing it on a regular basis. Step one in my plan to get better about prepping is to know what I want to make and this recipe is definitely going on my regular rotation. 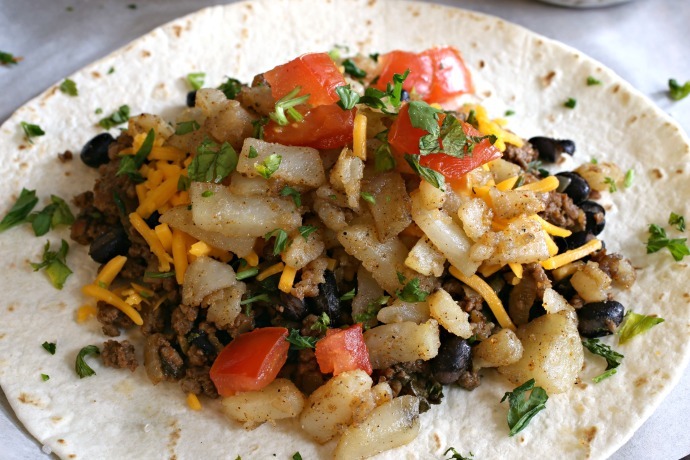 The prep work to brown some ground beef and stir fry potatoes is quite easy and putting them into a rolled up tortilla with cheese and beans gives me a great re-heating vehicle. I just popped the already rolled up burritos into the oven to heat and got the added benefit of a crispy outside. Although Tex-Mex flavors are more associated with rice, I think the potatoes re-heat better. Also, I really love potatoes and these little crispy, seasoned potato bits are so good. 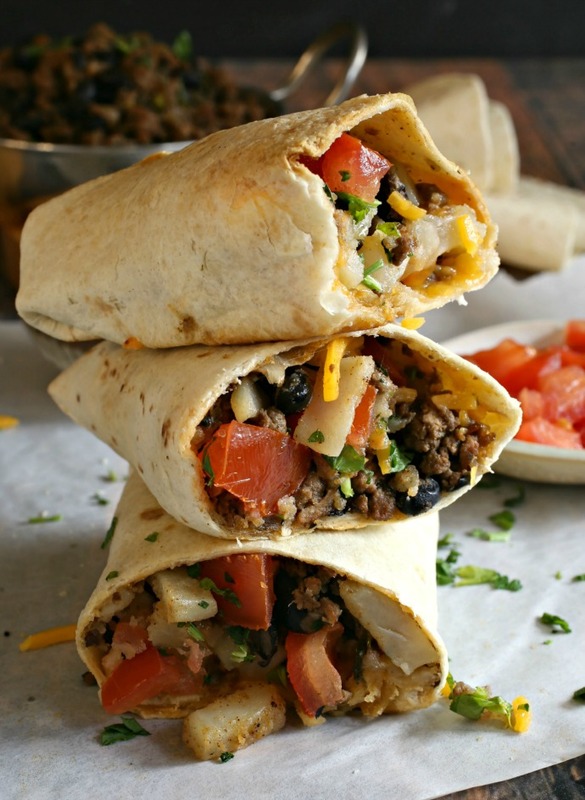 Try not to eat them all out of the pan before you assemble the burritos, OK? Or, hell, just make extra. I'm not judging you. Enjoy! Add the ground beef to a large skillet or cast iron pan and cook on medium heat, stirring often, for about 5 minutes until lightly browned. Add the diced onion, salt, cumin, garlic powder, chili powder and black pepper and continue cooking and stirring for another 5 minutes. Stir in the black beans, tomato sauce and cilantro and continue cooking, on medium low heat for an additional 5 minutes. Remove the mixture to a separate dish. Add the olive oil and potatoes to the pan and cook, stirring often, until softened and lightly brown. Season with salt to taste. 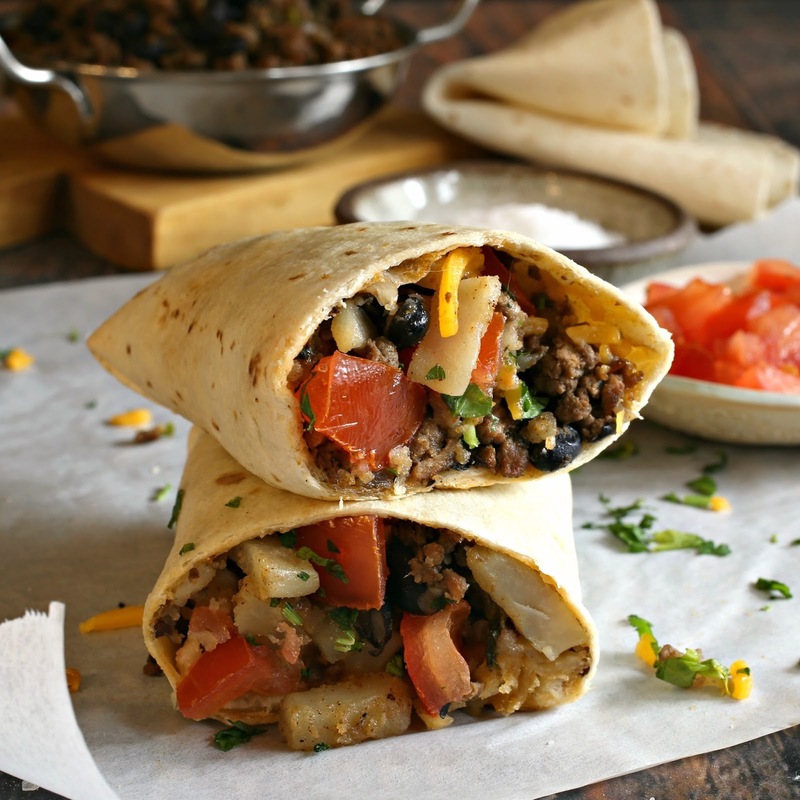 Assemble the burritos by adding an equal amount of the beef and bean mixture to the middle of each tortilla. Top with cheese, potatoes and the diced tomatoes. 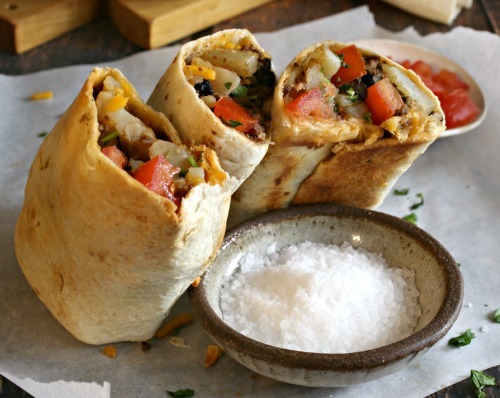 Roll up and either serve immediately or wrap and refrigerate or freeze until needed. 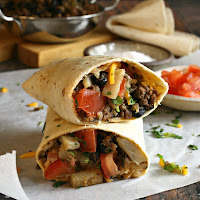 To heat up the leftover burritos, brush the outside with olive oil and heat for 10 to 15 minutes in a 400 degree oven. This recipe is sponsored by the Idaho Potato Commission. For more information and recipes, please visit their website. Thank you for supporting the products I love and use in my kitchen.